Hello everyone and welcome to the first edition of Much Abrew About Nothing, a brand new series here on MTGGoldfish. Special thanks to Matt Sperling for the awesome name. One thing we've had a ton of request for over the past few months is a series showing off upgraded versions Budget Magic decks. Much Abrew About Nothing falls at the intersection of Budget Magic and Against the Odds. In this series we'll feature cool, under-the-radar decks that are too expensive for Budget Magic or too competitive for Against the Odds. Basically, this series is a place where I get to play whatever cool deck happens to catch my fancy, without worry about prices or losing millions of games for your viewing pleasure. RallyFenza is what Rally Vampires always wanted to be. It's not just a good budget option, but a real Modern deck. Since arriving at the current list. I am 9-1 on Magic Online. My record is 1-0 vs Death and Taxes, 4-1 vs Twin, 2-0 vs Burn, 1-0 vs Control, and 1-0 vs Zoo. While I don't think our Twin matchup is really 80/20, it does feel fairly strong. 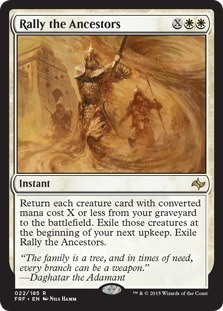 We can combo off just as fast as they can and more resiliently thanks to Return to the Ranks and Rally the Ancestors. This deck has been killing it, and I think it has the potential to be a real player in the format. Looking over the most played decks in Modern, I believe we have a positive matchup against most of the field. Lets begin with the bad matchups. Infect is bad since it doesn't care about life gain and is typically faster than we are. We do have access to the full set of Path to Exiles to give us a slight chance post board. Amulet Bloom is a nightmare because we don't interact well with Primeval Titan or the Hive Mind kill. Tron and Merfolk feel like 50/50 matchups depending on the draws. Affinity is also super draw dependent. We are dogs in game one, where they can usually beat us down with random fliers and creature-lands, but in game two we get not only Path to Exile, but Stony Silence and Disenchant. Where does the deck crush it? We destroy removal based midrange decks like Jund and Abzan. Their plan is to kill our creatures and win with ground beaters. Our deck wants our creatures to die and can block Tarmogoyf and Tasigur, the Golden Fang for eons. We are usually fast enough to beat Scapeshift, especially when you consider our life gain means they need more than seven lands to combo off. Burn, Zoo, and other ground-based aggro decks are some of our best matchups. Not only do we beat these decks, but I'm 2-0 in games where our opponents resolve Rain of Gore and Leyline of Sanctity, two of the better cards against our deck. Basically, we are favored against anything looking to win with ground creatures, direct damage, and/or removal. We are slightly favored against slower combo decks (Scapeshift, Twin), 50/50 against decks where our ability to block doesn't matter, and disadvantaged against fast combo decks. Just like Rally Vampires, Blood Artists and sacrifice outlets are the centerpiece of the build. 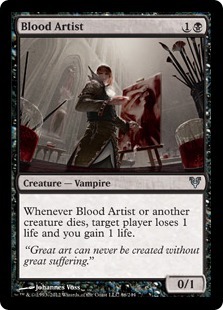 Unlike Rally Vampires we don't have to play Kalastria Highborn as Blood Artist numbers 5-8. 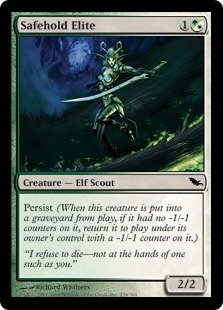 Zulaport Cutthroat fill that role, which is great because paying mana for the "drain" trigger is pretty clunky. Since we don't play Kalastria Highborn, we don't need the rest of the Vampires. 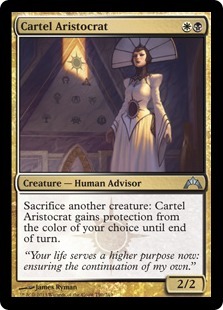 Instead, we get to play with Cartel Aristocrat, one of the best "sac" outlets in Modern. 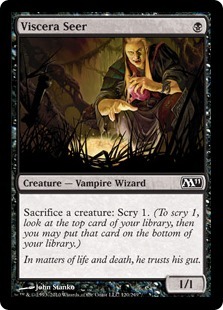 As you'll see in the videos, I started with Bloodthrone Vampire in the two-drop sac outlet slot, but it quickly became apparent Cartel Aristocrat was better since it is more resilient and a much better blocker. However, the biggest benefactor of the non-Vampire build is we get to play an infinite combo. With Rally Vampires, it typically took us two or three turns to grind our opponent out. We would build up a board, sac it away while scrying to find a Rally the Ancestors or Return to the Ranks, get everything back with said spell, and rinse and repeat until our opponent was dead. While we still win most of our games in this fashion, the addition of Anafenza, Kin-Tree Spirit and Safehold Elite allows us to randomly kill our opponent out of nowhere, starting on turn four. The combo is basically the same as Anafenza, Kin-Tree Spirit with Kitchen Finks or Murderous Redcap. After testing the two persist creatures, I realized what we really needed was a persist creature that we could get back from the graveyard with Return to the Ranks. Enter Safehold Elite. With a Blood Artist, a sac outlet, and Anafenza, Kin-Tree Spirit on the battlefield, we can loop Safehold Elite an infinite number of times, dealing infinite damage and gaining infinite life. We can do this from our graveyard (with Return to the Ranks), at instant speed (with Collected Company), or from our graveyard at instant speed (with Rally the Ancestors). Incorporating Collected Company was a watershed moment for the deck. Collected Company ensures our opponent never gets comfortable. Regardless of how bad things look for us, we are usually a draw away from winning the game. It's a similar feeling to a Twin player with Deceiver Exarch on the battlefield. Instead of being a slow, grindy, resilient deck, we are now a grindy, resilient deck that can also combo an opponent out on turn four. The other thing that was missing from Rally Vampires was a way to fill our graveyard. 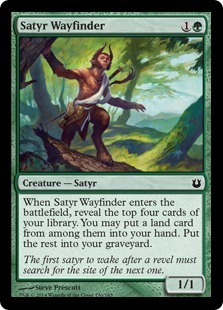 While we could do it eventually with our sacrifice outlets, Satyr Wayfinder makes Rally the Ancestors and Return to the Ranks more devastating. Plus Wayfinder allows us to trim the number of lands, down to 21, and still cast our Collected Companys on time. Speaking of Collected Company, when I first started working on an updated version of the deck it was straight White / Black. Then I realized we were either flooding or fizzling way too often. Since we have 27 creatures with a converted mana cost three or less, Collected Company is the perfect solution to the problem. Collected Company gives us an additional way to combo off out of nowhere. I've had a few games where our board consisted of Viscera Seer and Anafenza, Kin-Tree Spirit — not exactly a scary situation for an opponent. But when they tapped out to loot with Desolate Lighthouse, we cast Collected Company to hit Safehold Elite and win on the spot. The sideboard is still a work in process. Currently I've been siding in Path to Exile against Twin, Infect, and Affinity. Duress and Thoughtseize come in against control decks and decks with specific hate cards like Grafdigger's Cage (beatable) and Rest in Peace / Leyline of the Void (less beatable), Disenchant also comes in against the hate card I just mentioned. Stony Silence is for Affinity and Tron. Eidolon of Rhetoric is for Angel's Grace, Storm, and other random, "big turn" combo decks. 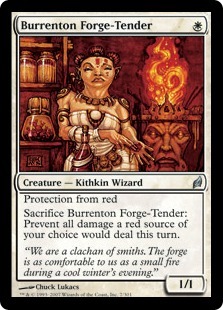 Two cards that could find a home in the sideboard are Reclamation Sage and Burrention Forge-Tender. 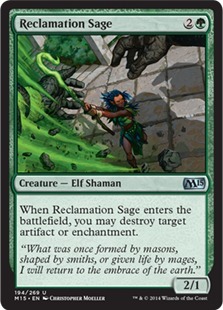 Reclamation Sage is probably better than Disenchant, since killing an artifact or enchantment at instant speed is rarely important to our deck, and we can hit Reclamation Sage with Collected Company. Burrention Forge-Tender, on the other hand, is a great answer to Conflagrate from the Angel's Grace combo, but I'm not sure it's better than Eidolon of Rhetoric which has applications against more decks. Try to sequence your plays so you always have a sacrifice outlet on the battlefield. 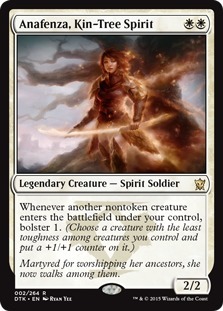 While having creatures that die to Lightning Bolt and Kolaghan's Command is fine, having them get hit by Path to Exile is detrimental to our game plan. You can attack with Safehold Elite, sacrifice it during your second main phase so it comes back untapped, and convoke it to reduce the mana cost of Return to the Ranks. Don't be afraid to aggressively sac your board with Viscera Seer in search of a lethal Return to the Ranks or Rally the Ancestors. Obviously, if you can win the game without taking such an aggressive line, that's great. One out of every 8.5 cards in the deck is a mass reanimation spell, so the odds of hitting one aren't that bad. Likewise, if you are going to lose the game the next turn, there is no downside to sacing everything to Viscera Seer in hopes of finding an out. Leyline of Sanctity shuts down the Blood Artist kill, but it does not shut down Zulaport Cutthroat because his drain ability isn't targeted. Never cast Rally the Ancestors without a sac outlet. If you have the combo set up, but are missing a Blood Artist, you can use Viscera Seer, Anafenza, Kin-Tree Spirit and Safehold Elite to infinitely scry and put Blood Artist on top of your library. Right now our biggest weakness (apart from fast combo, which already gets better post-board with Thoughtseize, Duress and Eidolon of Rhetoric) is getting beat down with Inkmoth Nexus, Vendilion Clique, Vault Skirge, and other fliers. Lingering Souls is a solution to this problem since we don't really need to kill a flier. We just need to keep it at bay long enough to combo off. Blocking with a Spirit token and sacrificing the token before damage to generate a few Blood Artist triggers goes a long way against Affinity, Infect, and Restoration Angel decks. Plus, some decks just lose to Lingering Souls by itself. The problem with Lingering Souls is that it's a no-bo with Return to the Ranks, Rally the Ancestors, and Collected Company. I've been hesitant to put Lingering Souls into the current build. I just don't know what to cut since our list is super tight and has zero flex slots apart from the singleton Path to Exile. 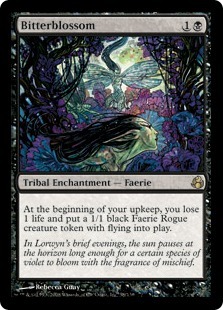 Bitterblossom seems like it has potential since the life gain from Zulaport Cutthroat and Blood Artist negate the life loss from Bitterblossom. Here we run into the same problem, it just doesn't work well with the rest of our non-creature spells. The point is, I think this deck really wants Lingering Souls in the 75 to shore up some less than great matchups, but I don't know how to make it work. If you have any suggestions on how to incorporate Lingering Souls or Bitterblossom into RallyFenza, make sure to let me know in the comments. Just in case you didn't figure it out while watching the videos or reading the article, I love this deck. Even beyond my personal feelings, it has proven itself to be not only competitive, but extremely powerful. If I was heading to a Modern Grand Prix or SCG Open this weekend, I would be playing some version of RallyFenza. And I would expect to be successful with the deck. It's that good. The other thing I'm excited about is just how endless the possibilities are for the archetype. Beyond the eight Blood Artists and eight sac outlets, there are a million possibilities. You could go tokens with Lingering Souls and Bitterblossom. You could add in more green and play Voice of Resurgence and Chord of Calling to make the Anafenza, Kin-Tree Spirit the focal point. Other people have mentioned Lotleth Troll, Bloodghast, and Gravecrawler. Now that we have eight Blood Artist, eight Return to the Ranks, and eight amazing sac outlets the sky is the limit. Don't be surprised if we see another Modern Rally deck on MTGGoldfish in the future. I don't think I've gotten it out of my system yet. RallyFenza just too much fun and explosive to leave. Anyway, that's all for today. Leave your thoughts, opinions, and ideas in the comments. You can reach me on Twitter (or MTGO) @SaffronOlive.